Free after three – free resident parking. Requesting restriction change and line installation. City of Fremantle licence plates. All residents are eligible to apply for a permit to park to for free within the Fremantle city centre at certain times. on-street (kerbside) parking only. Car parks not included. See the Free residents parking permit conditions of use for more information. Download the change of registration form. If you are a resident or a ratepayer living in either a time restricted or fee-paying area and do not have adequate off-street parking, you may be eligible for a residential parking permit. A residential paid parking permit is a sticker affixed to the windscreen of the assigned vehicle. It displays the registration number, expiry date and the streets the permit is valid for. A multi-purpose parking permit is a permit in form of a card that can be transferred to different vehicles such as visitors. Properties that are in a fee-paying street (ticketed area) are not eligible for multi-purpose parking permits. If you live in a group of units, permits can be issued subject to approval if there are less than 9 units in the residential complex i.e. no permits will be issued to a residential complex that has 9 or more units. Download an application form or contact customer service centre on 9432 9999. There is an abandoned vehicle in my street - Please keep in mind that Fremantle has a large number of travellers, students and share houses. This may mean that on occasion, vehicles may be left on the road reserve for longer than usual. If you suspect that a vehicle is abandoned, stolen or unlicensed, contact our customer service team on 9432 9999 and the Integrated Patrols Officers will attend and investigate as soon as possible. Someone is parked on my verge – the City's policy is that where unrestricted, road and verge use is free for all public to use. This may mean that the verge adjacent to your property may be used by a vehicle. Unless there is a restriction in place, and/or the vehicle is parked contrary to the Parking Local Law 2006 or Road and Traffic Act 1974, the vehicle may not be in breach. Someone is obstructing my driveway - contact the customer service centre on 9432 9999 to report such parking for a timely attendance. A vehicle is parked on my property, can it be towed? – the City can only enforce its by-laws on council owned land. 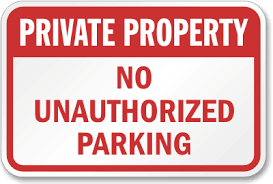 If you wish the City to deal with any illegal parking on private owned land, you are required to obtain a private parking agreement first. If you witness any illegal or hazardous parking that does not fall in the above categories, contact us on 9432 9999 to raise a patrol request. Residents may contact the City to consider restrictions and line/signage installation in their streets. The current residential and multi-purpose parking permit policy states ‘the City's preferred method is to allow for natural ebb and flow of traffic in non-commercial areas’. The City would like to refrain from unnecessary line installation. In circumstances such as parking near an intersection, in front of a driveway or on foot path/pedestrian crossing, signage may not work well as a preventative measure and frequent patrols may be preferred. If you wish these changes to be made, forward a detail explanation to the City for consideration. The City will assess the area and conduct an internal and external consultation to identify the best solution. Businesses, strata management companies and land owners can apply for a private parking agreement with the City to enforce Parking Local Law 2005 on any private owned land. Upon receiving the application, the City will pay a site visit and assess the requirements and eligibility. Please be aware that all applications are subject to approval. Proper and adequate signs are required for the City's integrated patrols officers to enforce the parking by-laws. These signs will be installed by the City at an additional cost. Signs must be installed within a distance indicated by Australian Standards AS 1743-2001. City will install minimum signage when it can to avoid sign pollution. Private parking agreement application can be found here. Fees associated can be found here. Contact the City’s parking department on 9432 9811 if you have any questions. Reserved bay applications apply to regular and loading zone bays, and do not include no stopping/parking areas, bays designated for authorised officers or special class vehicles and bus zones. Up to 10 traffic cones (2 per bay) at no additional charge. Parking permits and reserved bays are only available for normal parking bays. Does not include Taxi Bays, Tour coach/bus bays or loading zones. Refer to the Parking Services Coordinator for more details. Attach a map of the specific bays to be reserved. Permits can be issued for specific streets and car parks. Does not guarantee availability of bays on the day. Allows for time and paid parking exemption with permit displayed. Allows for service vehicles and commercial vehicles to park in loading zone. Allows exemption from time restrictions. Long-term parking may be organised online through our vPermit system. Simply create a vPermit account and then use your credit or debit card to pay for your parking. vPermit will assign you a ‘virtual permit’ associated with the number plate of the vehicle or vehicles you drive. The system is largely self-service so you’ll be able to manage any changes to your permit in your own time. If you have any problems registering for a vPermit they can be contacted for assistance on either 9432 9999 or info@fremantle.wa.gov.au. If you are a tradesperson working with a resident or business on a short or long-term contract in Fremantle you can apply for a reserved parking bay. The permit also exempts your vehicle from time and paid parking restrictions. More information can be found on the reserved parking bay application form. Parking restricted car bays can be reserved for events. Contact customer service to arrange a hood hire. The permit issued should be clearly displayed inside the vehicle. Customised City of Fremantle license plates are available for purchase. Contact our customer service centre on 9432 9999 to enquire of the available plate numbers. The customised license plates cost $330. Please allow 6–8 weeks to process the application.